Every year, J.D. Power administers several surveys in order to discover some of the most noteworthy vehicles on the current market. Recently, the 2018 J.D. Power US Automotive Performance, Execution and Layout (APEAL) Study revealed some of the highest year-over-year increases in the history of its run. Now in its 23rd year, from November 2017 to February 2018, about 68,000 purchasers and lessees were surveyed during their first 90-days of ownership of a 2018 model year vehicle. Throughout the survey, the owners emotional attachment and level of excitement across 77 attributes was measured. These attributes range from the power owners feel when they accelerate on the gas to their sense of comfort once they sit in the driver’s seat. The industry average APEAL score increased from 810 points in 2017 to 820 points in 2018 - on a 1,000-point scale. Seating, Heating /Ventilation/Air Conditioning, Exterior, Interior, Storage and Space, and Fuel Economy. According to the APEAL Study, the Lincoln Navigator has the highest overall APEAL score (915) of any model year. This is the highest level recorded in this generation of the study - the U.S. APEAL study is currently in its third generation (2013-2018). Another first in the APEAL study, specifically the mass-market segment, includes Chevrolet and GMC. For the first time, both brands were ranked the highest with a score of 826 - that’s a 16-18 point improvement compared to 2017. Ram follows in third scoring 825, then Dodge and Ford, both scoring 824 each. Finally, the most improvement award goes to Mitsubishi, which increased by 33 points compared to 2017. 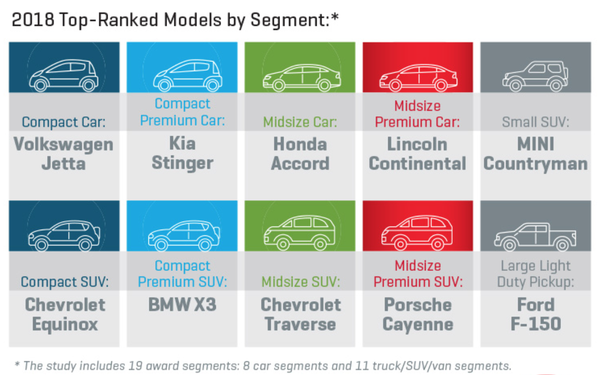 For 2018, Ford Motor Co.’s Ford Expedition, F150, Mustang,and Lincoln Continental came in first place after receiving the most segment-level awards. General Motors and Volkswagen AG both receive three awards, while BMW AG, Honda Motor Co, and Hyundai Motor Co receive two awards. Lastly, Fiat Chrysler Automobiles and Nissan Motor Co. win one each. Repeat award winners from 2017 include: Audi A3, BMW X1, Chrysler Pacifica, Ford F-150, Lincoln Continental, Honda Ridgeline, and Porsche Cayenne. From the writers at NowCar, we send a big congratulations to all the winners of the J.D. Power APEAL Study! Interested in one of these awarded vehicles? visit NowCar.com or stay updated on NowCar social media.